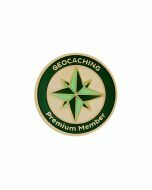 In 2000, Geocaching.com was started as a hobby site with 75 geocaches. 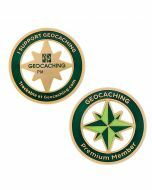 Today there are over 3 million geocaches placed worldwide. 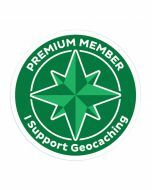 Since the early days of geocaching, Premium Members have played a crucial role in promoting and supporting both geocaching and Geocaching HQ's efforts to grow, innovate and adapt this amazing game. Premium Members take a lot of pride in what they do for the game, and we get many requests to help them to show that pride! 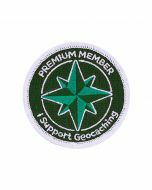 The Premium Member Collection is a set of great products that you can send traveling, show off at events or brag about to your geocaching friends and Muggles alike. Be proud of your premium with the Premium Member Collection! 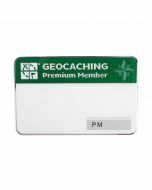 The Geocaching Premium Member Collection Travel Tag is trackable at Geocaching.com. A chain is included for hitchhiking. Dimensions: Approximate diameter of 1.5 inches (1.75 inches when including the chain loop).